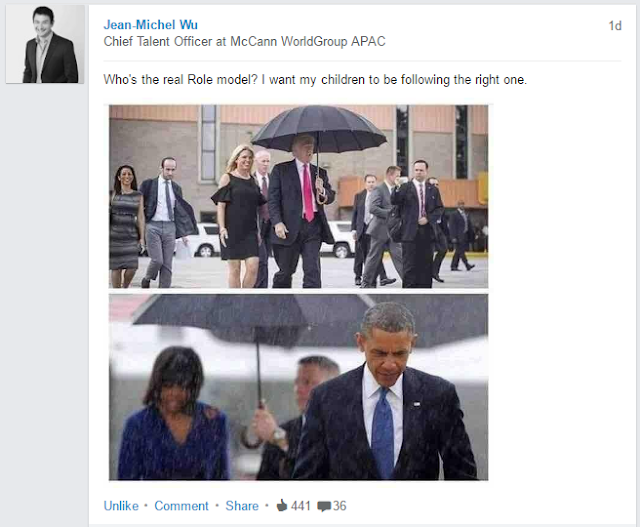 I've rarely seen a better example of leadership in action than in the juxtaposition of these two photos, kindly shared on LinkedIn by Jean-Michel Wu of McCann Worldwide. Now let's be clear up front - these are carefully selected images, presenting single moments in time - so they aren't necessarily representative of the style of either leader represented, either the US's political leader, Barack Obama, or business leader (and Republican Presidential nominee) Donald Trump. However the notion of a leader who shields himself, at the expense of others, as compared to a leader who shields others before themselves, is one that anyone aspiring to leadership or in a leadership role should reflect on. We've seen many examples of 'leaders' who fail to take responsibility for their own actions, or for the actions of those under their direction. These so-called leaders shield themselves while actively or passively allowing others to take the blame for actions or inaction that they were ultimately responsible for. Example abound of this practice. In government there's functionaries falling on their swords to protect their Ministers, and senior public servants pushing the blame downhill, to junior staff, or to vendors. In the private sector there's many examples of this type of behaviour, although it is not as often on public display. However it is sufficiently common that it has become an advertising punchline. When this type of behaviour is displayed by leaders it erodes trust and respect - in them and in the organisations they lead. When the behaviour becomes public it can be devastating to an organisation's brand and reputation - but even if it remains hidden within the walls, it can significantly affect an organisation's performance over time. One of the casualties is likely to be innovation and invention, as employees witnessing 'scapegoating' or 'passing the buck' behaviour by their leaders will be less inclined to take risks in order to avoid getting the blame. Another casualty is organisational culture, which will tend to become more secretive as staff hide potential mistakes and fearful, as staff worry about being made the next example. Whereas a leader who shields others, 'running interference' and supporting their staff will foster a very different culture. Staff will be more inclined to innovate as they know they won't be blamed for failure, and their managers will ensure they get credit for their successes. A shielding approach also gives teams the room to solve problems rather than hide them, paying enormous dividends in the long-run. Cultures will be more open and inclusive with this second type of leader. Staff more collaborative and sharing, rather than hoarding information to protect their roles. Of course there must still remain appropriate mechanisms for managing poor performance - but these will be seen as fair and equitable, rather than vindictive or aimed at protecting the upper echelons from their own decisions and actions. Organisations that encourage, foster and employ leaders who choose to shield their staff, even sometimes at personal expense, will ultimately be more successful - more innovative and more adaptable. So if your organisation is trying to foster an innovation culture, a good start is for its leaders to walk the talk by walking in the rain.